Dr. Carr lives in Hardin county with her husband and two children. 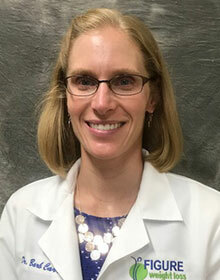 A native of Fort Wayne, IN, Dr. Carr earned her medical degree from the Indiana University School of Medicine and completed Emergency Medicine residency training in San Antonio, TX. She is board certified in Emergency Medicine. Dr. Carr is dedicated to providing compassionate and individualized care to our patients by helping them achieve their weight loss goals by making healthy and sustainable lifestyle changes. Start Your Journey Today!Our Program. Your Success. Our staff is happy to answer any questions you may have about losing weight on the Figure Weight Loss Program. Please contact us via phone or fill out the form for more information.